Glutathione can be found in plants and animals and is a peptide made up of three amino acids: Glutamic acid, Cysteine and Glycine. Glutathione is an important water-soluble antioxidant that plays a role in supporting muscles from free radicals. L-Glutathione is a biologically active, naturally occurring tripeptide composed of L-Cysteine, L-Glutamic acid and Glycine. 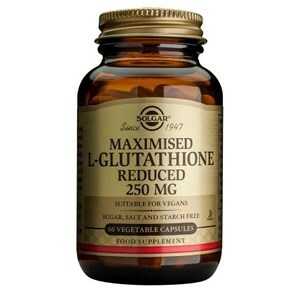 Solgar Maximised L-Glutathionie (Reduced) 250 mg Vegetable Capsules provides a high potency source of L-Glutathione. Amount Per ServingL-Glutathione (reduced) (Free Form)250 mg****Daily Value not establishedOther Ingredients: Microcrystalline Cellulose, Vegetable Cellulose, Vegetable Magnesium Stearate, Silica. If you are pregnant, nursing, taking any medications or have any medical condition, please consult your healthcare practitioner before taking any dietary supplement. Discontinue use and consult your healthcare practitioner if any adverse reactions occur. Keep out of reach of children.? Store at room temperature. Do not use if outer bottle seal is missing or damaged. Thank you for your interest in Solgar Maximised L-Glutathione Reduced 250 mg Vegetable Capsules. Enter your email and we'll contact you as soon as it's available again.